Two men are searching for the truth about the NFL/NFLPA drug testing program. 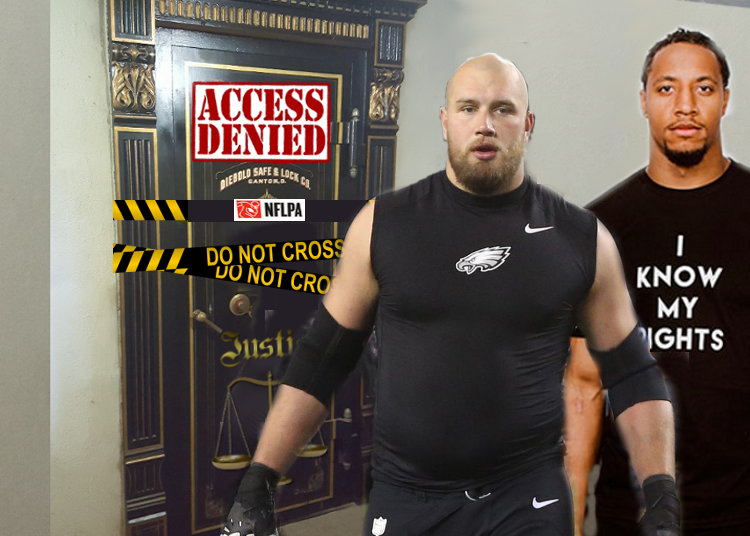 Last week a federal court denied Philadelphia Eagles OT Lane Johnson’s discovery bid, to find out why the NFL/NFLPA deviated from the collectively bargained performance enhancing substances testing policy regarding his testing. He’s in federal court because the NFLPA withheld documents to explain the deviations from policy he experienced. He claims retaliation and collusion with the NFL by his union. Eric Reid, a safety with the Carolina Panthers isn’t buying the NFL/NFLPA claim there’s nothing unusual about the fact he was randomly tested seven times in eleven weeks. He’s seeking discovery of his own and likely coming to some of the same conclusions as Johnson. Reid’s attorney, Mark Geragos has demanded that the NFLPA turn over all pertinent information. The relevant question is, will either man ever be able to get to the bottom of what appears to be a tangled web of deceit. On January 6, 2017 Johnson filed a lawsuit in the Northern District of Ohio against both the NFL and NFLPA. He sought to have a PED suspension vacated after being subjected to what he felt were gross deviations from collectively bargained policies, a sham arbitration and betrayal by the union to which he pays his dues. Johnson had been found guilty of a PED violation once before and as a result was placed on the league’s probable cause list for regular testing for prohibited substances. He claims he learned from that experience and tried to take extra care to ensure that he didn’t ingest something he wasn’t supposed to. He relied on the Aegis app provided by the NFLPA that designates which nutritional supplements are allowable and which aren’t. To his dismay and surprise, he wasn’t removed from probable cause testing after the two-year period had concluded, and though he only used supplements with a green check mark on the app, failed a urinalysis, leaving him subject to another suspension. This was only the beginning of Johnson’s problems, however. As the PED violation was investigated, Johnson learned that a supplement he’d used—one with a green check mark and designated safe—contained an unlabeled ingredient that was prohibited. Upon discovering this he publicly criticized the NFLPA for providing an inaccurate app to union members, which caused him to inadvertently ingest a banned substance. Things only went downhill from there. He felt the union retaliated against him and conspired with the NFL regarding his arbitration. He identified several deviations from the CBA and published PES Policy but was never provided with documents that would demonstrate the legitimacy of the deviations. Most seemed to be undocumented verbal agreements between NFLPA and NFL. Johnson identified conflicts of interest and contradictory testimony and was denied any discovery in his arbitration. Johnson filed complaints with the Department of Labor and National Labor Relations Board in November 2016. The NLRB complaint against NFLPA contains a litany of serious allegations against the union—and even after two years in federal court, none of them have been properly addressed. Johnson filed his federal lawsuit in the Northern District of Ohio, where his attorney Stephen Zashin found success in litigating on behalf of Mike Pennel, who experienced only a fraction of the harms Johnson alleges. The NFLPA brought in their top-gun attorney, Jeffrey Kessler to do battle against their dues-paying member. In the Pennel case, Judge John Adams seemed deeply concerned that backroom deals and gentlemen’s agreements were being made between the union and the NFL, superseding the membership’s collectively bargained rights. Here are some key excerpts from Pennel’s hearing transcript, with attorney David Greenspan of Winston Strawn representing the NFLPA. Pennel had requested that the court appoint an arbitrator for his grievance because the union and the NFL had violated the written provisions of the CBA as to the number of arbitrators in the selection pool. While Pennel’s suspension stemmed from a violation of the Substances of Abuse Policy rather than Performance Enhancing Substances Policy, the arbitral provision for these policies is near identical in requiring a pool of between three and five neutral arbitrators. Only two had been appointed and Pennel had misgivings as to their neutrality. After the hearing a private settlement was reached and the NFL and NFLPA agreed to add another arbitrator to the Substances of Abuse arbitrator pool. They should have been on notice to either correct the error and add at least one additional arbitrator to the Performance Enhancing Drugs Policy pool, or at the very least modify the terms in writing, with approval from their membership. They did not. Johnson encountered the same issue and was backed into accepting the arbitrator selected by the NFL with agreement of the union. Since Judge Adams seemed alarmed that an undocumented gentleman’s agreement altering the CBA had occurred, the NFL and NFLPA apparently didn’t want to argue the case in Ohio and in January 2017 had it removed to the NFL’s preferred venue, the Southern District of New York. There, Judge Richard Sullivan, who was assigned to preside over Johnson’s case seemed unconcerned, at best. On October 3, he issued an opinion dismissing all but one count in Johnson’s complaint against the NFLPA. Though no discovery had taken place Judge Sullivan found the NFLPA arguments to be reasonable explanations for the policy deviations that Johnson pointed to and didn’t see anything arbitrary about them since they impacted all players. I did a point-by-point on Judge Sullivan’s decision here, for those who might be interested in a closer look. 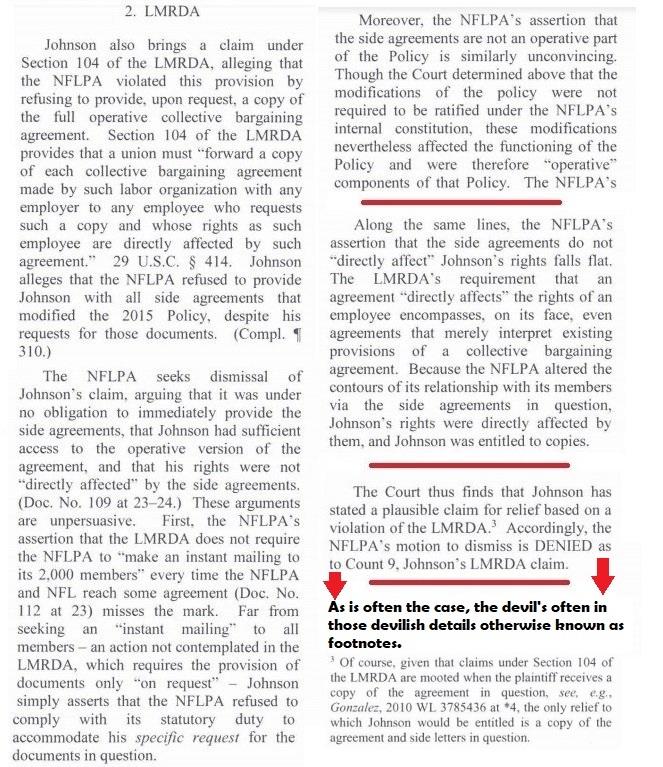 Because it was impossible to dispute that nearly two-years into the case the union still had not provided Johnson with the documents he was entitled to under the Labor-Management Disclosure and Reporting Act (LMRDA), a single count of Johnson’s claim remained active. After recapping a substantial amount of evidence supporting Johnson’s claims, Judge Sullivan inexplicably implied this could be corrected by merely providing Johnson with the documents. Steve Zashin, Johnson’s attorney pushed back and stated in no uncertain terms was this unacceptable. Zashin is 100% correct, in that to permit the NFLPA to back away this easily only encourages additional misconduct. He asserted Johnson’s desire to finally obtain discovery which he believes would prove the retaliation claims that Judge Sullivan claimed he didn’t plead with enough particularity, which in and of itself underscores a major shortcoming of modern courts. It’s a circular argument that is nearly impossible to win. Plaintiffs are increasingly asked to plead with particularity information that could only be obtained through discovery only to have their cases dismissed because they weren’t granted the discovery, they needed to deliver the particularity the judge demanded. It seems this has occurred yet again. The NFLPA flooded the court with documents of every kind except the ones Johnson requested. They provided declarations from the very people Johnson suspected of collusion, that indicated no knowledge of written agreements. Again, these were people Johnson suspected of collusion and asked to depose. Inexplicably, this didn’t seem to raise any eyebrows for the Judge, nor did he seem to have a problem accepting their word. 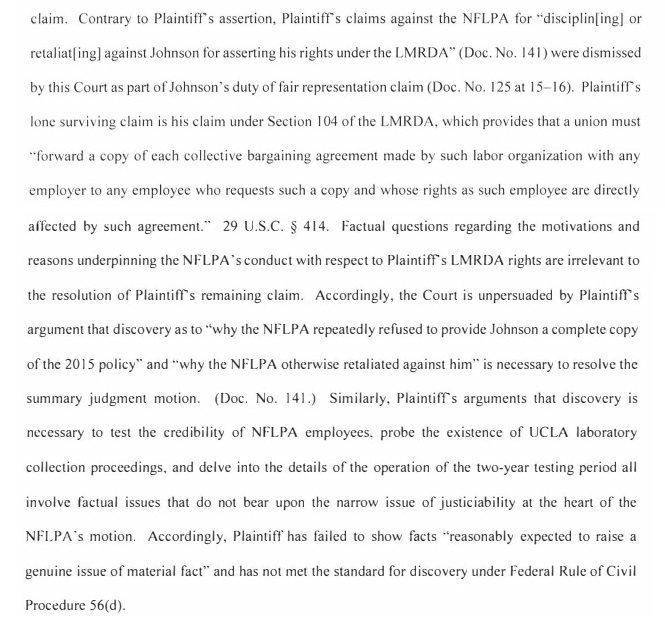 “Similarly, Plaintiff’s arguments that discovery is necessary to test the credibility of NFLPA employees, probe the existence of UCLA laboratory collection proceedings, and delve into the details of the operation of the two-year testing period all involve factual issues that do not bear upon the narrow issue of justiciability at the heart of the NFLPA’s motion.” In view of the fact Johnson still has not been provided complete documentation or satisfactory explanations of verbal agreements, what other means does he have at his disposal? The conclusion of the order demands that Johnson respond to the NFLPA’s motion for summary judgment by January 16. Johnson’s attorney has crafted and presented a compelling and disturbing case. It almost seems as if the judge simply wants to get it closed and move on to his Second Circuit appellate appointment. Hopefully Zashin can pull a rabbit out of the hat. He’s a skilled lawyer and I am not. Perhaps he’ll find a way. Without the benefit of discovery, however, it’s hard to imagine any lawful means of obtaining the information that could stall what at this point seems inevitable. Will Eric Reid succeed in obtaining discovery? Zashin’s prediction of encouraging further union misconduct seems to be unfolding in plain sight with Eric Reid. Reid was the first NFL player to kneel alongside banished quarterback Colin Kaepernick in his protest of police brutality against people of color. It appeared for quite some time that Reid was slated for the same fate as Kaepernick. He was constantly denied workouts or offers after he entered free agency. Both men filed a collusion grievance against the NFL regarding their employment. Initially, Boston was baffled when few teams came calling with the caliber of contract offer he expected. Soon, he developed a theory of his own. “Nobody could find a football reason why it was happening,” Boston says, “but people know why.” Boston doesn’t mention Eric Reid by name, but as he explains his reasoning, the reference is unmistakable. In Boston’s eyes, NFL teams are trying to cover themselves for not going after Reid. Reid eventually found employment with the Carolina Panthers on September 27 after their starting safety, Da’Norris Searcy was placed on injured reserve. Reid, who has never had a drug violation became a regular on the urinalysis PED random testing protocol. He claims he was tested seven times in eleven weeks. While the first test was procedural upon signing, the randomness of six more in eleven weeks, tends to stretch the credibility factor of randomness a bit thin. Reid disputed the findings as did his attorney Mark Geragos, and as Al Neal writes in People’s Word, “My question to the NFL Players Association: Why would he lie?” A reasonable person would be forced to conclude that he Reid has nothing to gain by lying and a great deal to lose should his credibility be damaged. If Reid should be able to gain adequate discovery and demonstrate that the players union is collaborating with the NFL against its own members, I’d go a step further and say it could be the biggest sports scandal of all time. Based on Johnson’s experience and other areas in which the union has been less than transparent, I’d wager that it’s more probable than not Reid is correct. The first red flag comes from the person entrusted with the investigation, Dr. John Lombardo. He is employed by joint agreement of the NFL and the players association, so it’s as much a stretch to say his investigation was “independent” as a lung disease study funded by Phillip Morris. Lombardo is one of the key people Johnson had hoped to depose. It will be interesting to see if Reid gains access to the information as to how Lombardo’s investigation was conducted. As a former project manager and analyst for a software company with some background in computer programming, it’s easy to see how the computer algorithms could be manipulated, and without examining the source code, go undetected. It would only take a simple conditional statement such as the one below to get the job done. It’s basically that simple. The function could be entered or removed through an automatic software update, that takes place in the background similar to the way Microsoft Windows updates its operating system. There are, of course other ways this could be done and it’s important that Reid has the opportunity to gain access and have it examined by someone who knows what to look for. The NFLPA has drawn too many red flags in too many areas to be given the benefit of doubt. A trustworthy investigation must be undertaken. As reported by Yahoo Sports, other players have found themselves randomly selected for testing at peculiar times. When Atlanta Falcons punter Matt Bosher leveled the Panthers return man Kenjoy Barner he found himself rewarded with a drug test after the game. Yahoo Sports also chronicled the strange testing saga of Indianapolis Colts punter Pat McAfee. One of the most notable examples of strange random drug tests comes from former Indianapolis Colts punter Pat McAfee. In near identical circumstances, McAfee laid a massive hit on Denver Broncos return man Trindon Holliday in a 2013 game and was “randomly” selected for a drug test the next day. The NFL has given McAfee other suspiciously random tests later too. He got a drug test a day after tweeting a pair of 420 jokes in 2016. He also received a drug test just two days after booming a 67-yard punt against the Buffalo Bills in a preseason game months later. Mike Neal is another example. In case you’re trying to place Mr. Neal, he was one of the NFL players accused in 2016 of using PEDs in an Al Jazeera documentary, along with Peyton Manning, Clay Matthews, Julius Peppers, and James Harrison. Having retired, Manning “fully cooperated” with the NFL’s investigation and all accusations against him were quickly swept aside as the NFL made aggressive demands against Matthews, Peppers, Harrison, and Neal. Encouraged by the NFLPA, the four players stood their ground against the NFL’s invasive bullying until they were threatened with indefinite suspensions should they fail to comply with all the league’s demands. At that point, Matthews, Peppers, and Harrison, who were signed with teams, backed down and made their appointments with Roger Goodell. Free agent Mike Neal was the sole player to hold out on the league’s demands and appears to have paid a steep price. Though he agreed to meet with Goodell two days after the other players, who were quickly exonerated, no mention was made of Neal aside from a side note that his investigation was continuing. Where was the union that so aggressively urged the players to take a stand? Crickets. I did an investigation to find out whatever became of Neal but ran mostly into dead ends. Neither the NFL nor NFLPA would comment as to his status but working back-channels I was informed that he had been through two hearings “represented” by NFLPA counsel Heather McPhee. My source used the quotation marks around the word represented. Neal was suspended shortly after the second hearing never to be seen in the league again. His suspension isn’t even recorded in the official records. Where was the NFLPA? The consensus seems to be that Mr. Neal wasn’t important enough to put up a costly fight for, and therefore he became a defenseless scapegoat for his defiance of the NFL. NFL player representatives are scheduled to vote by mid-October on whether to retain DeMaurice Smith as the union’s executive director and bar other candidates from challenging him for the job, under a new set of election procedures not previously disclosed publicly. The voting rules, outlined in a set of documents obtained by The Washington Post, establish what amounts to a referendum this fall on Smith retaining the job he has held since 2009. The procedures put the decision of whether to sign Smith to a contract extension in the hands of a 14-member selection committee and the board of team-by-team player representatives. If those players opt to keep Smith, the union would not consider other candidates for the executive director job. Despite the changes to the NFLPA constitution, the 2007 version of the document remained on the NFLPA website. It wasn’t updated until Mehri obtained a copy of the current constitution and and posted it on his website that it was updated by NFLPA. [T]he way in which the NFLPA reappointed Smith has raised a few eyebrows. Smith, who was elected to the position in 2009 and reelected to new three-year terms in 2012 and 2015, was supposed to again face an election process in the spring of 2018. Instead, NFLPA leadership quietly voted to change its constitution this spring to alter its selection process, allowing a small group of NFLPA representatives to renew Smith’s contract unopposed. Mehri, who received public endorsements from Harry Carson and other notable retired players as well as general support from the retired NFL community, contends the process was changed to ensure Smith and his supporters retain their power. According to the Globe, “Mehri said he was barred from speaking to any of the 14 voters about his ideas or the new selection process. 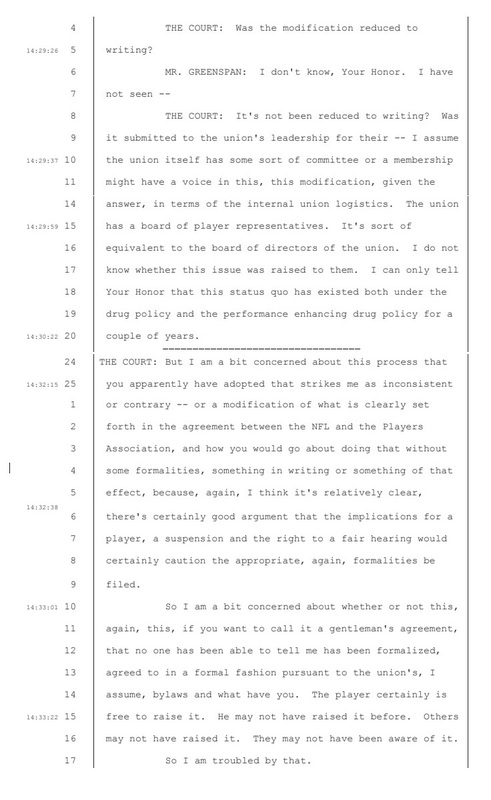 And he claims that when he spoke to the player reps — most of whom were not part of last week’s vote — none of them even knew that the constitution had been changed.” It seems a small elite group continues to succeed despite the failures of the CBA which benefit the elite at the expense of the majority of players, not to mention the ten-year term that was agreed upon Many players have entered and left the league without ever having a voice in governance of their union. Johnson and Reid believe that something scandalous is taking place too. Johnson was denied the discovery he needed to prove his allegations and seems destined to see his case end in summary judgment for the NFLPA unless Zashin can maneuver his way to a miracle. Reid seems to be the next hope for rescuing the union from what appears to be a cartel that has no problem in making backdoor deals with the NFL and tossing players who might have minds of their own and dare question the hive mentality under the bus. Decades ago the requirements for filing a suit were relatively easy to satisfy. All the plaintiff needed to do in his pleading was give notice of the lawsuit and its subject matter to the defendant. And the purpose of procedure was understood primarily to help get the case to the merits, which at that time meant to trial. Today in federal court, and in some state courts, the plaintiff must allege facts at the outset of his lawsuit to convince a judge that his claim is plausible. The rationale is that plaintiffs should not have access to court-ordered discovery of information from their opponent until they have demonstrated both a factual basis for their claim and that these facts describe the kind of event that a judge thinks might have happened, because discovery is costly in both money and time…Requiring parties to state the facts that they know is fair, but this standard takes no account of how information is asymmetrically distributed: one party may have information that the other party needs for his claim (or defense) to succeed. In instituting new requirements for filing suits, the Court considered the cost of revealing information, but not the cost of hiding it. The result demonstrates how narrow the Justices’ view of litigation has become. Lahav, Alexandra, In Praise of Litigation (p. 23). Oxford University Press, 2017. Kindle Edition.